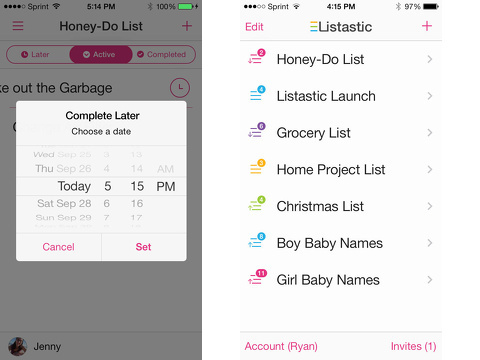 Listastic is a solid, straightforward list making and sharing productivity iPhone, iPod Touch, and iPad app. The bright, clean interface and intuitive navigation create a simple, functional, and user-friendly experience. The free Listastic iPhone app download has limited scope, but, to access full functionality, there is a current promotion for a two-week free trial. You can permanently upgrade to keep full functionality by selecting from one of the following options: 3 months for $3.99, 6 months for $6.99, and 12 months for $12.99. You may cancel at any time. An option for a family or enterprise package would be great. The shared list function could be helpful for families, volunteer groups putting together an event, and small business. You can quickly create an account. You enter your email, then tap new account. You add your email, establish a nickname, and set up a PIN. The process to create a list is simple. You name it and select a color code from bright, current selections. You simply type in items, but you can also add pertinent details. This is particularly helpful when you are sharing a list, so you can be even more clear and helpful. You may want the Belgian chocolate-covered almonds in the small container, not those in the large container. I have resorted to drawing a layout of the store to help my son find items, so the opportunity to add a location in the details is awesome. If details are added, there are three dots by the item name in the list. For each list, there are three modes just below the top menu bar – later, active, completed. You tap an item, and options slide up from the bottom of the screen. You can find out who added the item on shared lists and date added. You can choose to delete item, do later, mark as completed, or edit details. The ability to monitor progress is another useful feature. The Listastic iPhone app has additional neat touches. From the home screen, you can see how many items are currently needed to complete each list. 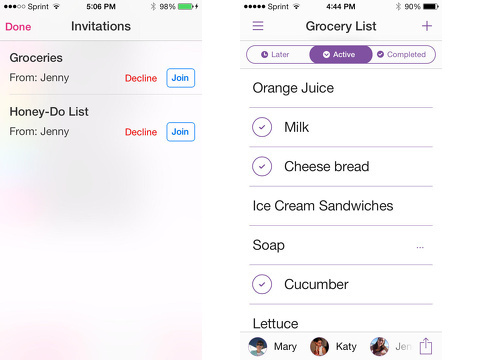 You can share your list with other Listastic iPhone app users. Color-codes allow you to assign responsibility and create categories. Each color could be a chore list for your child, so you can be less of a nag. You can also create to-do lists for an assistant or assign to a project. The Listastic iPhone, iPod Touch, and iPad app is easy to use and has a lovely visual presence. It doesn’t break the mold, but it does maintain a nice balance between having too many options and not enough. The pricing is, perhaps, a bit high for the number of tools, but there is a lot of promise in the Listastic iPhone app. Developer: McLean Mobile Solutions, Inc.
AppSafari review of Listastic was written by Jenni Ward on October 16th, 2013 and categorized under App Store, Free, Productivity, Utilities. Page viewed 3657 times, 3 so far today. Need help on using these apps? Please read the Help Page.